FOUNDING FATHERS IN PARIS: Literary walking tour, in the footsteps of Jefferson, Franklin, Adams ... and in their own words! Sundays July 1 and 8, 2-5pm. Reservations and info: 01.42.08.00.42, 06.22.50.71.29, lire.et.partir@wanadoo.fr. Being in Paris around the Fourth of July means no hometown parades with clanging fire trucks, no fireworks, and no Boston Pops playing the Star-Spangled Banner. But Americans in Paris have learned that being an expatriate doesn't mean being an ex-patriot. A number of American groups organize special Independence Day festivities. Most are for members and their guests. A source of inspiration for the guesstimated 100,000 - 200,000 Americans living in the Ile-de-France. Today the American Club hosted a Fete Champetre at a member's house near Giverny, a 40-minute ride from Paris. So worth the trip! Mother Nature was kind,and the group of 60 or so French and Americans had some good old US-of-A fun and food and even a spot or two of sunshine. It's so uplifting to blend the Gallic and the Yankee traditions: for example, we never served excellent Bordeaux at any childhood July 4th barbecues that I can remember. It definitely should become a new tradition, y'all. The All-American recipes were prepared by a French chef from the nearby village, and let me tell you, he makes one mean potato salad. Delish! Hamburgers, barbecued chicken, brownies -- the whole enchilada (well, no enchiladas, actually). It was particularly amusant to explain the notion of a silent auction to the French attendees. And the Presidential Quiz! I won't mention names, but one enterprising lady spent 14 minutes on her cell phone with her daughter, who googled all the answers. That's what I call ingenuity. All ages, lots of activities, GREAT music. And a tombola (raffle). Lucky me -- I got Carlton Moody's fabulous CD, "Meet me in Paris Tennessee," a perfect reward for a splendid Franco-American Fourth. More celebrations and outings tomorrow! I swear, I had nothing to do with it. I posted this on my blog before Associated Press broke the story. You may call me Scoop from now on. Murder on the Rue Vaneau? This morning when I went down to deposit my recycling in the dark stairway off the courtyard, I came upon this grisly scene. Postively Poe-esque. The bac à bouteilles was overflowing, and next to it, this abandoned body, face down. Things must be pretty rough out at EuroDisney. Poor Mee-kay. I just stumbled on a tumblelog, Topinambours. Rapidly becoming addicted. I've gone speechless. From Perec to dingbats to Charles Ives in Paris to ... oh, never mind. Just check it out. And don't miss Topinambours' link to the Tour de France 2007 on Google Earth. My other not-so-secret addiction. Lace up your baskets and get ready to go! The Mairie de Paris is sponsoring the Second Annual Chasse aux Tresors (Treasure Hunt) on Saturday, July 7. Open to Parisians and non-residents alike, the hunt is ideal for energetic adventurers with a sense of curiosity and esprit de corps. Alone or in teams, on foot or on public transport, participants will go from site to site finding "clues" to the final treasure. Hunters will roam the winding streets and discover some of the lesser-known parts of Paris. Last year some 9,000 participants joined in the quest for "gold". The gold, in this case, comes in the form of prizes offered by the sponsors of the event, including Michelin and Gallimard. The quest begins at 10 am in front of the mairies of the 3e, 6e, 13e, 18e and 19e arrondissements and continues until 1 pm. Award time in front of each of the mairies is at 3:30 pm. Participation is free and open to all. Sign up at http://www.tresorsdeparis.fr/ or simply show up at one of the above mairies in advance of starting time. Remember April? April in Paris? That glorious month of azure skies and balmy weather just weeks ago, when Parisians were tsk-tsking with worry about abnormally high temperatures and what-will-we-do-if-this-heat-continues? It's been all downhill since then. The month of June has been significantly cooler, blustery and raw. Sure, we've gotten some much-needed rain, perhaps, but enough already! And what has happened to all the happy springtime attire? Instead of gauzy linen and school's-out frivolous fashion, many Paris denizens are back in light winter jackets (in the morning at least), scarves coiled around necks, and in general the layered look to adjust to the mood swings of la météo. Tired of shivering, surrendering to defeat, I finally turned the heat back on in my apartment yesterday. C'est un temps de novembre is the word on the streets. Let's hope Mother Nature is fickle and surprises us in a day or two with some good news. Your umbrella: don't leave home without it. Taking time out to devour the weekend edition of Le Figaro is a special treat. After dutifully digesting the political news and analysis, I turn to my favorite section. Le Carnet du Jour gives readers the chance to take stock of the current trends in French baby names in "Naissances", and to mourn the passing of the old guard in the "Deuils". What a difference a few generations make in the first names. Here's a sampling from this week's baby announcements, including first names of young siblings. In some cases it wasn't clear whether the name was male or female. Now from the death announcements, a different era of French names. Average age is a remarkable 92, out of the ages announced. And if you'd like to compare them to US first-name trends, check out the Social Security Administration's website, which lets you query popular baby names by year and state. Or a similar French site. A (fun) major time vacuum. 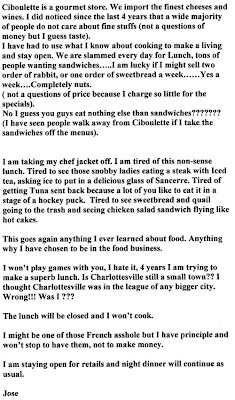 A devoted reader in Charlottesville, VA (okay, it's my sister, Suzie-Vous Francais) sent this rant from the owner of La Ciboulette. He posted the note on the restaurant door this spring. If only he could see the noon-time hordes of Parisians queuing up outside the doors of boulangeries to buy their... sandwiches! He's got a point about ice in the Sancerre, though. Click on the image to read. Read the controversy in the Cvillain. Dollars to Donuts ...to Croissants? When I finally made the Big Decision to move to Paris, it was January of 2006. 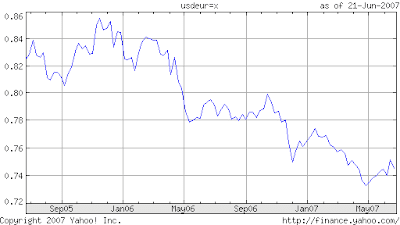 Budgets were calculated, and financial planning -- already not my forte, I admit -- was loosely based on a "slightly-more-than-a dollar" figure for calculating the exchange rate with the euro. Ulp. I keep wondering. Where is that crystal ball when I need it? That international-monetary crystal ball, I mean. Proud maman that I am, I just had to show this aeronautic feat. Le Bourget may have John Travolta at the Paris Air Show. 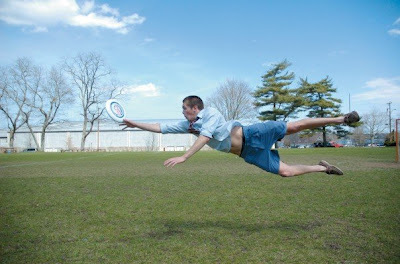 But in my biased maternal view, neither Travolta nor the new Boeing 787 can compare to this handsome frisbee-catching wonder. Photo courtesy of Hyemi Joo. Is any one else besides me clapping with one hand about the news that regulators have cleared European airlines for take-off to allow in-flight phoning? My other hand, of course, is clutched firmly on my cell phone. This is not my idea of progress. Now airline passengers will be subjected to endless jabberings of their seat-mates: paramours and corporate wannabes, and anyone else who thinks they absolutely MUST connect to terra firma or else be doomed to withering on the vine. Or crying young lasses, weeping into phones over the break-up at the airport. In fact, what will happen to all those lovely, romantic Hollywood-style good-bye airport scenes? If the conversation can continue while the plane is bumping through the atmosphere at 10,000 feet over the Dolomites, then instead of the tender kiss, the teary departure at the security checkpoint, it will simply be "Call me from the plane." Will there soon need to be "Vols Silence" like the "Voitures Silence" on the SNCF, which brook no cell phone usage, no shrieking little darlings? Can we beg them to limit the in-flight service to just quiet text-messaging? To be sure, there are times when I wish I could make a call in flight (Did I leave the tea kettle blistering on the stove? Did you remember to transfer the embezzled funds to that Swiss bank account? ), but in general I find it unnecessary. Even more unnerving is the notion of plane-to-plane phoning, which is next: "My flight's almost empty -- I got three bulkhead seats. Cute attendant. How's yours?" While the owners of the OnAir, the satellite service, claim that in-flight phoning rates will be expensive enough ($2.50 per minute) so that no one will likely spend a long time on the phone, I'm not holding my breath on that assumption. And I doubt that future flying phoners will hold their breath, either. Well, naturally, any headline that shouts "Americans in Paris" is going to grab my attention. When a friend forwarded me the news from the New York Social Diary about Saturday's American Friends of Versailles gala, I couldn't help but be green with envy. 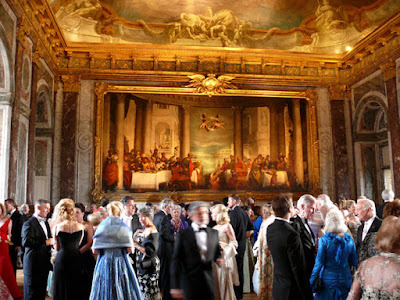 Le Bal Marie Antoinette: a great party, at Versailles, with grandees to beat the band? And all in the name of French-American friendship... and Versailles, of course. Quite the soirée, it seems. Alas, Cinderella here didn't even get invited. Sniff. Not that I had the mega-euros to cough up for a swish fundraiser of that grandeur, of course. Or the pumpkin. On the Number 70 bus, heading back from Hotel de Ville, I was happy to find a seat. Actually, I sat in a place prioritaire, to be ceded to personnes agées or mamans avec enfants. Fortunately for my tired feet, no senior citizens or young mothers were on board, so I reveled briefly in my good luck. A young woman sitting across from me was engrossed in a phone conversation and I stared blankly out the window. Suddenly my fellow passenger jerked her head back, startled, and I saw why. Dancing down the inside of the window between us was a one-inch wasp, looking for lunch. Not wanting to be any guêpe's pincushion, I sprang into action. In very unladylike fashion I removed my ballerina flat from my right foot and -- thwack! -- the nasty little critter was history. I added, "Oui, un guêpicide?" A round of muffled guffaws rose from the supposedly non-eavesdropping fellow passengers who were packed around us. One of the decided advantages of living in Paris, besides living in Paris, is the ability to explore the countryside on the weekend. This weekend I had the opportunity to take a quick trip to Normandy. Some American friends invited me to visit, at the chaumiere that their family has owned for 40 years. For them, a place of fond memories of childhood summers spent lovingly restoring and furnishing a beautiful but once-ramshackle compound of buildings. For me, a chance to escape the "golden prison" of Paris and marvel at huge trees bending in the breeze, smell freshly-mown grass, and to wake up with the cows and an explosion of birdsong. You can get to Heaven. It takes only 1-1/2 hours on A-13. Directions to get to the house were so delightfully country-esque. "Go past three fields, take a left at the white house, go past the manoir that you can't see any more; then the road takes a dip, and go right at the allee of trees. If you reach the forest, you've gone too far." I missed the turn and, ending up in the village by mistake, waited to be retrieved by my hosts. I parked between the local restaurant (which serves up intoxicatingly delicious 5-course meals for about 16 euros) and the small chapel. Villages in Normandy seem so magical, and yet there is a deja-vu familiar quality to them. I finally realized that it came from having watched so many World War II movies and television shows in my youth. Driving through Normandy, I think I subconsciously expected American "soldiers" such as Vic Morrow or Lee Marvin, in Army uniform, to spring out from behind a grey stone building to surprise the enemy and save the day. I don't know about other girls my age, but when I was in grade school I was a die-hard Combat! fan every Tuesday night (I think I can still hum the theme song) and thought that The Dirty Dozen was one of the most romantic films of all time. Not for any love scenes -- I don't remember any -- but for the thrilling romance of bravery, valor, and ... all those men in uniform. When I watched those action-packed dramas, and Good triumphed over Bad, I felt that all was right with the world. In Normandy, it still feels that way. Clearly, I haven't been frequenting the be-all-and-end-all of my favorite Paris stores, BHV (bay-osh-vay) often enough. I passed by today as I headed to rue Vieille du Temple, and there were so many more outlets than I remembered last time, just a few months ago. One store for pets, one for men (what's the diff? ), plus the usual tile, plumbing and other extensions of the main store. Do we hear a major real-estate-vacuum whoosh going on as the store expands in the Hotel de Ville area north of rue de Rivoli? Since its humble origins in 1901, it seems that the BHV (Bazar de l'Hotel de Ville) has apparently never stopped expanding to meet the needs of its clientele. For years when I was a mere touriste in Paris, I did all my souvenir shopping in the sous-sol of BHV: house-number signs, "Essuyez Vos Pieds" signs for my back door, little hardware gadgets that you can't find elsewhere, and especially the old-fashioned corkscrews made from fantastic gnarled sections of grape vine. All the items that I thought (and still do think) were quintessentially French. BHV has entered the 21st century with aplomb and clearly a good, albeit agressive, marketing plan. Even on this little side street just behind the main store, there is a fabulous mur vegetal, like the one at the Musee du Quai Branly. Adds much-needed greenery and a lot of visual appeal to an otherwise bland commercial setting. When -- when -- I remember to check my phone messages, this is what I do. "Bonjour. Vous avez .. Deux .. nouveaux messages. Appel du.. zero un quatrevingtquinze..."
Uh oh -- how much is that? My mind races as I do the mental math and try to listen to the next numbers. I scribble 01 85, cross out 85, write 95. I write down 14 because that's all I heard. Or was it 14, then 79, then 50? How can it be that learning numbers in French was the very first lesson way back in French I umpteen light years ago, but now conjuring them up is the very last skill to come automatically? Transcribing any number up to 69, I'm golden. When I have to start the add-ons, the compound numbers, like sixty-twelve or four-twenties-eighteen, I'm sunk unless there is that extra split second to absorb it. Nary a nanosecond of mercy in between the chiffres when you listen to France Telecom voicemail. Don't even get me started about trying to understand business people's gurgling voice messages on my portable (cell phone). I don't even try. A rushing river of numbers that I try to retain while walking down the street? Forget it. The solution? Defeated, I hit the trusty save button, "Pour conserver votre message, appuyer sur 2." Deux. A nice easy number. Got that. Today I was taking a much-needed break at a café on the rue de Sevres. Sitting on the terrasse sipping my Coca Light, relaxing. Suddenly a big red Parisian fire truck, les Sapeurs Pompiers, pulled up across the street. The café owner ran out and motioned to the Sapeurs where to come in. I hadn't smelled any smoke, and didn't think there was a fire back in the kitchen. Next one, then two, then three of the Sapeurs in their nice blue outfits came into the café. "Voilà, il est là," gestured the owner. Evidently a man had fainted in the back, and the Sapeurs were there in their function as EMTs. I was impressed with the non-rubbernecking of the clients in the café. They all went about their business, because whatever had happened to that poor man was not their business. Then a curious thing happened. The Sapeur who was waiting on the street -- by now the truck was parked out front with orange traffic cones -- took his long folding wrench and opened a valve under the manhole cover and water flowed along the curb into the street, the way it does for the Green Men who are cleaning the gutters. Then it dawned on me. There are no fire hydrants in Paris. None. I've always been a fan of the quirky sculptural quality of fire hydrants in the US. They simply don't exist in Paris; perhaps they did once, but no more. As I was leaving the café, I asked the handsome Sapeur (meanwhile wondering if good looks are part of the job description) about my revelation. Yes, he confirmed, "tous les postes d'eau à Paris sont souterrains" -- all water outlets for firefighting in Paris are underground. Chewing on a lot of blogging issues right now. I'm not a happy camper. Dazed and confused. I'm outraged at the thief who so blatantly stole Chez Pim's posts, more outraged that his blog is gaining in popularity from all the flap. I'm thankful to Sam, who posted a helpful comment at Chez Pim about Creative Commons, a licensing organization for the web. I'm sheepish about some of my earliest blog posts where I did use illustrations from the web that I in my naivete did not attribute, mostly for lack of graphics savoir faire in posting. I hope it wasn't too evil of me. I hope that those transgressions are somewhat absolved by the fact that I don't make any money from my blog -- not even any little "donate" widgets. I'm concerned because I just heard of someone (not a blogger) who apparently is making the rounds of Paris starting a work like my Real Americans in Paris project. I start worrying, wondering if I should just keep my mouth shut, stop blogging, and get back to throwing my heart, soul and time into paid writing projects. I had fretted about whether to post the announcement of Real Americans in Paris when I first began, but figured that it would lend more legitimacy to the project, and help publicize the casting call for interviewees. It has. But if it's true that another Paris expat has taken the idea and is running with it, where does that leave me? Do I get to say "I have dibs on that idea?" Or is it a question of running faster than the next guy to get the Big Project out there. A reader asked me if I was inspired by the film Paris je t'aime, and although I loved the movie, it's very different from my project. I've been studying the relationship of Americans to France for decades. I originally also had a proposal for interviewing "everyday" Parisians, but found that Run Around Paris does an excellent job of that. Real Americans in Paris is looking at the relationship between contemporary Americans in Paris and their adopted city. So here's what I'm chewing on. Do bloggers merely serve as a free source of information for those who are set to capitalize on their ideas and knowledge? Last night having a quick after-theatre bite to eat on boulevard de la Madeleine, I did a double take. Sure enough, slinking down the street at about 11:30 pm. there it was. A white stretch limo. License plate: LIMO 7. You can hang me by my thumbnails and torture me for days, but I will not renounce my opinion that stretch limos are tacky. There. I said it. White stretch limos are even worse. Somehow they are becoming so accepted, practically de rigueur in the US, as seen by this photo: of one of several stretch limos hired by kids for my son's Senior Prom last month in Massachusetts. So, yes, now I am resigned to the fact that limos are now mainstream in American culture. I said American culture. But stretch limos, in France? Oh, please. This is a place where aesthetics and substance are supposed to reign. Chic and glamour, not showy glitz. My friend said "C'est rare de voir cela." (It's rare to see that.) Gee, I sure hope so. You are cordially invited to attend a pre-screening of a the film Fragile(s) by Martin Valente, starring Marie Gillain, François Berléand, Caroline Cellier, Jean-Pierre Darroussin, Jacques Gamblin and Sara Martins. The screening will take place Wednesday, June 13 at 8 pm at l'Entrepot in the 14e. A talk with the film crew will take place after the film. The film is, needless to say, in French, as will be the discussions. Places for the screening are on a first-come first-served basis only by reserving online at http://www.avant-premieres.net. The meteo doesn't look too promising, but I'm getting a good night's sleep tonight anyway so I'll be fresh as a daisy for the Paris Bloggers' Picnic tomorrow. And still be alive enough to go to the theatre later without falling asleep. Fortunately my friend Carole brought me this witty T-shirt (whatever could have inspired that?) last winter. So at least I don't have to spend the usual hours deciding what to wear. Now here's something to celebrate. No longer will you need to suffer the humiliation (or calories) of hauling your laptop to McDo to get wireless internet service when your paid Neuf or Free internet service is down -- or if you're just visiting and need your daily email fix. Free Paree Wee-Fee is about to arrive. The long anticipated Wi-Fi Paris project is set to start in mid-June, which by my calendar means sometime in the next week. The Mairie de Paris has published an on-line map, by arrondissement, of over 400 locations where free wi-fi will be accessible, from 7 am to 11 pm, in libraries, museums, parks, mairies, and more. Just when you thought you'd seen it all -- miracle images of Mother Teresa in a cinnamon bun, the Madonna on the Freeway. And my small contribution, a curiously persistent stain resembling Jesus, on my left leather boot last winter, which Some People Thought I Was Tetched in the Head about. You know who you are. Now we have --ta-da !-- Holly Golightly on the sidewalk of Paris. 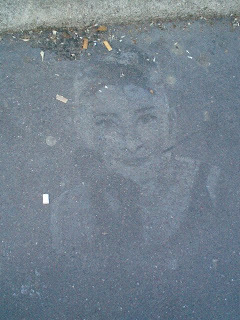 Yes, none other than the fetching Audrey Hepburn fading away underfoot somewhere on the boulevard St. Germain. Ghostly, n'est-ce pas? Do we think those other cigarette butts are hers? Many thanks to Rose, a dear reader from the States whom I met in Paris last month, for sending this to me. All rights to the photo are hers. Ah, it's good to be home in Paris, land of les baskets. Unless your head is totally in the clouds, for a long time now you can see on the streets Parisians of all ages and arrondissements sporting les baskets. 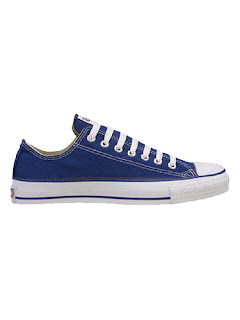 Is it just my bias, or is it true that only Parisians could make Converse all stars a fashion statement, wearing hi-tops or lo-tops with such panache. There are les baskets worn with les slim (usually skinny black pants), with jeans or even, as I spotted at the opera, a lady wearing them with a tony linen suit. Les baskets avec tout? But it goes beyond fashion. Les baskets are so ubiquitous that the phrase has taken on new meaning. The word, of course, comes from basketball, le basket. Les baskets are the shoes. So the phrase "il est bien dans ses baskets" has come to be the equivalent of "il est bien dans sa peau," meaning "he feels good about himself." "Avoir le moral dans les baskets" means to be a little depressed. But not me. I'm fresh off the plane, back home in my little parquet-moulures-cheminées in the 7th arrondissement. I am happy to be back, and bien dans mes baskets.